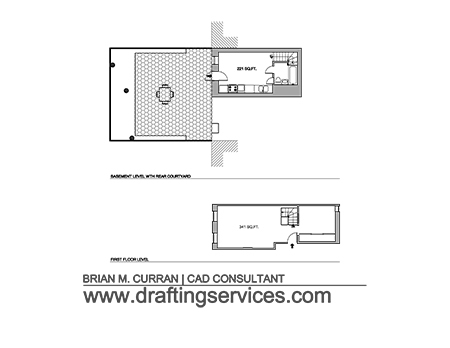 One of the drafting services that I provide is floor plan surveys. In this post, as a continuation in my series of project summary posts, I’ll review a project on which I provided such services. A floor plan survey, if you don’t know, is a two step process. It consists of first measuring the floor plan of an existing structure (e.g. apartment, building, house, etc. ), and then secondly creating a drawing of the measured structure, which is based upon the collected measurements. In this context, the word survey means to measure. A New York City homeowner contacted me because she wanted measured drawings of her cozy duplex apartment. She answered some preliminary questions that I had about the apartment, and then I issued her a simple proposal based on her needs. She accepted my proposal, so I then scheduled a date to measure the apartment when she could give me access to it. When I arrived at the apartment the homeowner gave me a walk-through of it. I then setup, and began sketching and measuring it. The space was small, so I was finished before I knew it!! Her apartment was on the ground floor, and had a door to a rear courtyard. I included this back courtyard in the survey too, because she wanted me to do so. Type and Location: A residential apartment located on the Upper East Side of Manhattan. Scope of Work: Create floor plan drawings of a residential apartment, and deliver the drawings to the client in AutoCAD and PDF format. Floor Plan Area: 562 sq.ft. Was the space occupied? : Yes, the resident was there while I was working. Access Restrictions: No, the resident was there to give me access. Total Travel Time: 2.00 hours total for the round trip. Comments: This was a small and somewhat cramped space, which slowed me down a bit. A project sample of floor plan survey drawings. This concludes this project summary post. Please drop by my blog in the future for similar posts!